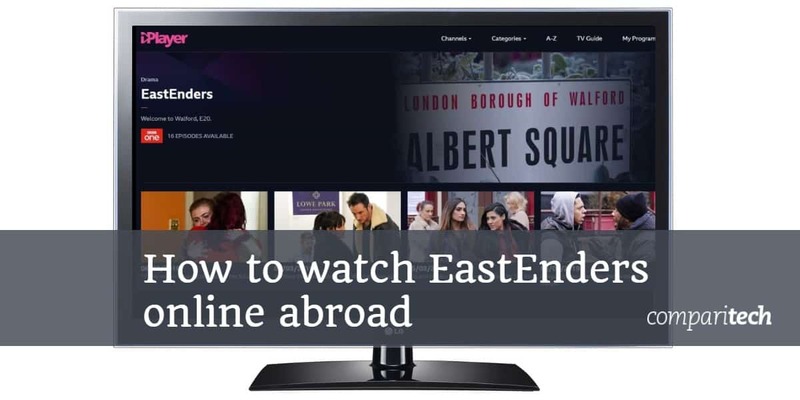 If you want to watch EastEnders for free online abroad in Spain, USA, Australia, Canada or any overseas country, you’ll have to connect to a Virtual Private Network (VPN) first. However, not all VPNs work. Eastenders airs every Monday, Tuesday, Thursday, and Friday at 7:30 PM GMT (12PM PST / 3PM EST) on BBC One. The BBC’s online streaming service, the iPlayer is only available in the UK, though, so you’ll need a VPN to access it online abroad, free of charge. VPNs increase your security by encrypting your network traffic, making it unreadable to any third party observers such as your ISP or network administrators. Additionally, they allow you to spoof your location by connecting to servers all over the world. This tricks sites into believing you’re located in a different country, bypassing any regional restrictions and allowing you to stream previously inaccessible content. First, register with one of the VPNs below (we recommend ExpressVPN). Next, download and install the software. Try loading a video on the BBC iPlayer. It should begin immediately, although you may have to clear your browser’s cache and cookies first. GET A PAID VPN FREE: Only need a VPN for a short time? If so, you can take advantage of ExpressVPN’s 30-day money-back guarantee. You’ll have to pay upfront but can cancel at any point to receive a full refund. This effectively means you can watch Eastenders abroad for a month without paying. ExpressVPN is capable of unblocking the most popular streaming services in Britain including BBC iPlayer, ITV Hub, Netflix, and Sky Go. Further, with its high-speed servers, ExpressVPN is fast enough to play high-definition content without any lag or buffering. Not all servers will unblock all video streams, but you can easily find out which ones do by contacting the 24/7 live chat support. It uses 256-bit encryption, DNS leak protection, and perfect forward secrecy to protect your data. A kill switch prevents you from streaming without protection. This service doesn’t log any personally identifiable information, accepts Bitcoin, and has a separate Tor-accessible site, making it perfect for users who value anonymity above all else. ExpressVPN offers dedicated apps for Windows, MacOS, Android, iOS, and Linux. Its custom firmware can be installed on select wireless routers. BEST VPN FOR EASTENDERS:ExpressVPN is our #1 choice It’s a fast, secure, privacy-oriented service capable of unblocking the iPlayer from anywhere. It comes with a 30-day money-back guarantee so you try it out completely risk-free. NordVPN has more than 400 servers in the UK, and they’re all optimized for HD streaming. This means you can watch EastEnders live on BBC iPlayer without any issues. Since this service is capable of unblocking other platforms like Netflix UK, All 4, and BT Sport, you’ll never be short of something to watch. With built-in anti-malware and ad-blocking features, NordVPN makes staying safe online incredibly simple. This service uses 256-bit AES encryption, DNS leak protection, and a process-specific kill switch to keep your browsing habits secure at all times. NordVPN keeps no logs and can be paid for in Bitcoin, making it a strong choice for privacy-focused users. NordVPN has apps for MacOS, Windows, iOS, and Android. Manual configuration is required for Linux-based systems and supported routers. LOW-COST, VERSATILE VPN:NordVPN offers comprehensive protection, high speeds, and excellent unblocking capabilities. Its plans all include a 30-day money-back guarantee. CyberGhost has more than 3,600 in 60 countries, and 422 in the UK alone. This VPN is fast enough to stream live HD video without any noticeable buffering and better still, it’s able to reliably unblock services like BBC iPlayer, Netflix UK, and the ITV Hub from abroad. Seven simultaneous connections are permitted too, so you can stream freely on whichever device you prefer. This service’s security features all come pre-configured and enabled by default. There’s 256-bit encryption, DNS and IPv6 leak protection, a kill switch (in every version), automatic ad-blocking, and a malware scanner built-in. CyberGhost doesn’t log any information which could identify you, but it’s possible to pay in Bitcoin if you’d like extra protection. This service is very user-friendly but if you need help, you can contact support 24/7 over live chat. CyberGhost apps are available for Windows, Android, MacOS, and iOS. It works with Linux systems and select network routers but must be configured manually first. NOVICE-FRIENDLY SERVICE:CyberGhost takes your security and privacy seriously. Further, it’s reliable, fast, and has excellent unblocking potential. CyberGhost has a 45-day money-back guarantee. PrivateVPN might only have four locations in the UK, but it’s excellent for streaming thanks to its high speeds and above average unblocking capabilities. It can unblock BBC iPlayer, the British Netflix library, ITV Hub, and All 4, among others. Better yet, PrivateVPN is fast enough that you can watch live HD content with minimal buffering. With a no-logs policy, 256-bit encryption, a kill switch, and protection against DNS and IPv6 leaks, this service ensures you never need to browse insecurely. It permits up to six connections at once, so you can protect an entire household with a single account. PrivateVPN offers live support 22 hours per day (excluding 1-3PM PST), and with your permission, the staff can remotely control your device to solve any issues. PrivateVPN offers apps for Windows, Android, MacOS, and iOS. It can also be manually installed on Linux systems and a selection of routers. FLAWLESS STREAMING:PrivateVPN offers high-speed connections, a no-logging policy, and powerful security features. It even includes a 30-day money-back guarantee. VyprVPN is great for streaming thanks to its high-speed servers and strong unblocking capabilities. It can unblock various services including BBC iPlayer, Netflix, and Hulu. Additionally, users gain access to online storage and encrypted messaging apps. This service uses end-to-end 256-bit encryption to keep your data secure. There’s a kill switch, DNS leak protection, and a proprietary scrambling feature called Chameleon, which claims to lower the likelihood of having your connection throttled by your ISP. VyprVPN logs the user’s IP address, connection time, and data transfer volume, but this is for diagnostic purposes only and all information is purged after 30 days. VyprVPN has Windows, MacOS, Android, and iOS apps. It can be installed manually on Linux systems and some routers. STREAM SAFELY:VyprVPN is highly secure, privacy-focused, and fast enough for live streaming. It also comes with a 30-day money-back guarantee. Can I use a free VPN to watch EastEnders? We know that free VPNs can be tempting, but we strongly advise against using them. To start with, these services are almost always slower than premium ones. This is because they have fewer servers and more people trying to use them. As such, videos will likely take a long time to load and may pause frequently to buffer. Because free VPNs can’t take money from their users, they have to find other ways to turn a profit. Unfortunately, this often comes at the user’s expense. For instance, they can inject ads into the sites you visit, track your activities after you disconnect, or sell details of your activities to third parties. This isn’t just speculation. We’ve seen recent cases where free VPNs install malware, mislead users about the logs they keep, and sell their users’ bandwidth without them knowing. To keep your personal information safe, we advise using a reputable VPN with customer-focused privacy and logging policies. Why isn’t my VPN working? Occasionally, you might find that you can’t watch content on the iPlayer even though you’re connected to a British server. Streaming platforms usually only have the rights to broadcast content in specific countries. With the growing usage of VPNs, large platforms have invested plenty of resources into detecting people who use VPNs to watch from abroad. This is often done by blacklisting VPN server IP addresses. Essentially, the process has become a cat and mouse game between streaming platforms and VPN providers: the platform blocks an IP address, and the provider changes the address that it uses. As such, most of the time, you can simply reconnect to the server and try loading the content again. If the problem persists, try connecting to a different British server. It’s highly unlikely that the platform has blacklisted every IP address from every server. You can watch EastEnders by connecting to any server in Scotland, England, or Wales. This is because the iPlayer has a consistent library regardless of where you are in the UK (Northern Ireland excluded). However, other platforms might have more specific restrictions in place. Take the ITV Hub, for instance. If you try to watch Scottish content like Rebus, you’ll be directed to the STV Player, which is the Scottish version of the platform. STV requires a Scottish IP address and users have to register for an account before they can watch anything. The ITV Hub also requires registration, but you can’t use your ITV Hub account on the STV Player site. Generally, there’s a fairly simple way of telling which server to connect to. Look at the plot description: if it’s set in Scotland, it’s likely a Scottish show and you’ll need a Scottish IP address. You can apply the same rule to Welsh shows, although Welsh servers are much less common. If you’re not sure which you need, use an English server — most of the time, this will work. 14 Can I use a free VPN to watch EastEnders? 15 Why isn’t my VPN working? 9 Can I use a free VPN to watch EastEnders? 10 Why isn’t my VPN working?